As Originally published in The Legal Investigator, Winter 2013. We know that's TV, but the question is, what can be done realistically to enhance surveillance video and what are limitations? I'm going to address the most common surveillance systems. The ones used at convenience stores, small businesses, home systems, supermarkets, etc. This does not apply to the high-end systems used in casinos and those installed at sensitive federal facilities. The typical commercial surveillance cameras (even most HD models) have a range of around 21 feet from a subject from which they deliver usable facial recognition data. When you walk into a super market or pharmacy and look for cameras. They are on the ceiling some 20 feet above the floor. They take pictures of the tops of peoples' heads. We work on two or three surveillance videos a week. Inevitably, in a hold-up scenario, the suspects are wearing a billed cap which obscures the face. They know the cameras are above them which is why they wear ball caps. Putting cameras in ceilings is easiest, but they would be much more effective installed at eye level. 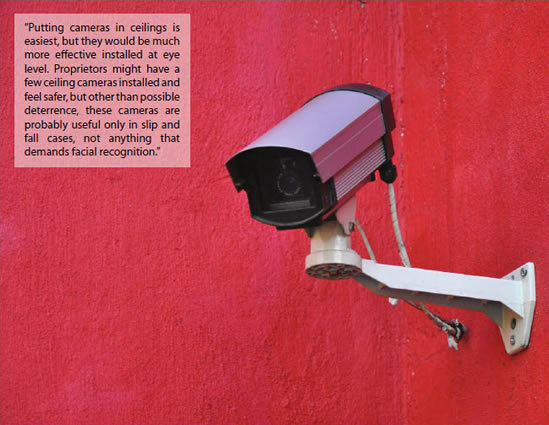 Proprietors might have a few ceiling cameras installed and feel safer, but other than possible deterrence, these cameras are probably useful only in slip-and fall cases, not anything that demands facial recognition. Since the cameras that are closest to the action are looking down at the cap-wearing suspect, we can't usually get a good image to clarify. In these cases we have to rely on the images captured by the cameras that are farther, and possibly caught a better angle of a suspect entering or leaving a scene. But the farther away the camera, the less chance there is of obtaining a useable image. Can that video be "enhanced"? Video enhancement depends on a number of factors. 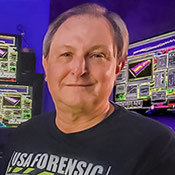 Bryan Neumeister, CEO of USA Forensics, is a court certified Audio and Video Forensic Expert. Mr. Neumeister has over 32 years of professional experience Clarifying Videos, Still Pictures (film and digital), and Audio Recordings so that jurors can better see and hear evidence. With studios and forensic equipment more advanced than most Federal Agencies, he is able video to large format still pictures for use as Exemplars.